The beverage company is testing a spicy cola for the summer, and consumers are already unimpressed. 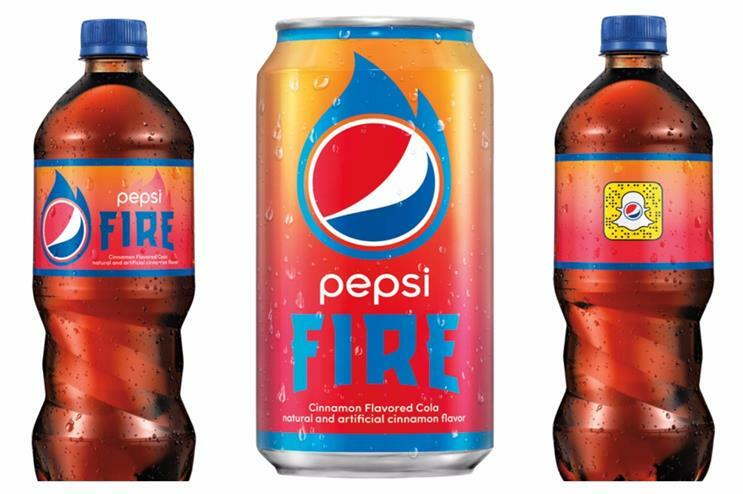 On May 22, Pepsi will introduce a cinnamon-flavored cola called Pepsi Fire, making it the latest beverage brand to try to spice up its product line. But Twitter users are already deriding Pepsi’s new flavor launch, even drawing comparisons to the failed ‘90s introduction of Crystal Pepsi. "Since Pepsi Fire is making its return to store shelves, do you think that it will taste better than Crystal Pepsi?" asked one cola fan yesterday. Yet Pepsi is banking on millennials, who helped revive the clear beverage for a limited run last year, and that generation's penchant for spicy flavors, to make the new cola a success. "Cinnamon’s hot, no pun intended," said Lauren Cohen, marketing director at Pepsi. "It’s certainly a big consumer trend that we’ve been following and what the consumer is asking for." Cinnamon is lately being added to products ranging from alcohol to cereals. However, cola fans will only have a short time to sample Pepsi’s cinnamon twist. Pepsi Fire will be available in stores and as 7-Eleven Slurpee drinks for eight weeks only. The temporary release, explained Cohen, is meant to "surprise and delight consumers with a product that we know they love, which is cola, with flavors that keep it interesting." It’s not the first time Pepsi has experimented with cinnamon-flavored cola. In 2004, the company introduced Holiday Spice for eight weeks timed to the Christmas season and brought it back two years later. "We have a rich history of introducing flavors in our cola business," said Cohen, citing the recent additions of black currant and citrus flavors to PepsiCo’s other cola brand, 1893. "You may remember we brought back a flavor in Crystal Pepsi, but this is the first time in a while that we’re bringing a truly new flavor into the lineup." The limited product allows Pepsi to "take advantage of trends without having to fully invest in what it would take to launch at full scale," said Duane Stanford, executive editor at Beverage Digest. It’s a strategy that could help Pepsi avoid a product flop like the introduction of Crystal Pepsi in the early ‘90s, he added. At the time, clear sodas were all the rage, and Pepsi began testing the product in markets like Denver and Sacramento in 1992. A year later, the brand released the product nationwide, complete with a Van Halen-serenaded Super Bowl spot. But by then, the clear cola trend was already on its way out. However, Stanford doesn’t predict a similar outcome with Fire. "Crystal Pepsi was a wide launch," he said. "It was intended to be an addition to the portfolio with a lot of marketing behind it." Pepsi, which spent $157 million in advertising in 2016 according to Kantar Media, is supporting Fire’s seasonal push with a multi-platform campaign created by its in-house agency and its digital agency Firstborn called "Get It While It’s Hot." The initiative centers around a Snapchat contest in which fans can snap codes on participating Pepsi products to unlock features like Pepsi-branded lenses and an online game called "Pepsi Summer Quest" for the chance to win prizes such as gaming consoles or a trip to Lollapalooza. "Summer is our most anticipated time of the year," but "the warm weather goes too fast," said Cohen. "We’ve partnered with Snapchat, a platform that’s known for its fleeting nature, to make sure that our daily prizes move quickly in a way that really reflects how quickly summer goes by." Pepsi will also promote the summer contest with a TV commercial from BBDO New York scheduled to air in June and an integration with TBS’ "Conan." Cohen wouldn’t disclose whether Pepsi plans to make Fire a permanent addition to its lineup if sales prove positive. Still, if sales don’t surge, "it’s only a limited time offering. There’s not a tremendous amount of risk in it," said Stanford. At the very least, Pepsi will bring more attention to its core brand. "When you’ve had a brand that’s been around that long, you have a loyal following, you have wide distribution, but you’re always looking for ways to remind people about your brand," he said. "Chances are, you’re going to get a lot of social media mileage out of it." However, so far, social media users have not been kind. Many customers have taken to Twitter to express their disgust even before tasting the cola, which has yet to hit stores. "I live somewhere that has 100° summer temperatures and you know what would quench my thirst? The new @Pepsi Fire!" said no Oklahoman. Pepsi fire ehh… sounds like belongs in the trash. Some even accused Pepsi of using Fire as a way to get consumers to forget its tone deaf spot starring Kendall Jenner. Cohen dismissed the online criticism about the timing. "Pepsi loves to do these things over the summer," she said. In fact, it was last August that Pepsi brought back Crystal Pepsi, a beverage that now sits in a literal Museum of Failure. Despite its disappointing performance 25 years ago, the product is making a comeback with millennials. "You’ve got this whole retro vibe going on," Stanford said. Younger Americans will simultaneously shun the brands their parents loved while "embracing the retro brands from periods when they were really little and maybe even periods that they never experienced themselves. You’re going to see soft drink companies continue to have some fun with that." So if millennials don’t catch on to Pepsi Fire, just wait 25 years. It’ll come back.